Steroids May Not Have Helped McGwire Fight Injuries : Shots - Health News Dr. Eric Coris, a specialist in sports medicine at the University of South Florida, says Mark McGwire's use of steroids probably didn't help him stave off injuries or recover from them more quickly. McGwire takes batting practice before the 1990 All-Star Game (left) and watches his 58th home run of the 1998 season, against the Florida Marlins. (right). 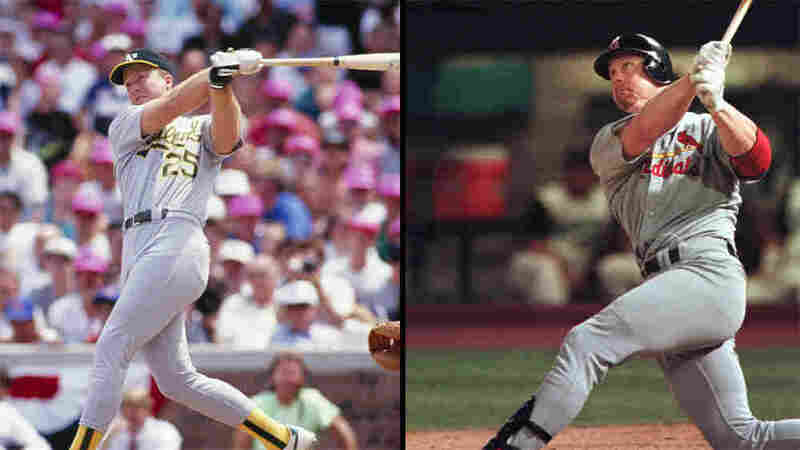 Now we now for sure that baseball slugger Mark McGwire took steroids for years. He finally admitted Monday to using the drugs throughout the '90s, including 1998 when he set a new mark for home runs. Why did he do it? Well, McGwire said he was injured a lot in the mid-'90s, with problems ranging from tears of his heel muscles to a strained rib cage. "It was definitely a miserable bunch of years and I told myself that steroids could help me recover faster," McGwire said. "I thought they would help me heal and prevent injuries too." But if those really are the reasons McGwire took the drugs, could steroids have given him the boost he expected? For answers, we turned to Dr. Eric Coris, director of the division of primary care sports medicine at the University of South Florida. Here are edited highlights from our conversation. What do you make of McGwire's rationale for using steroids? Injury prevention is one of the most common reasons that high-level athletes cite for taking steroids. Unfortunately, we have some science that says that's probably not very accurate. Anabolic steroids help your body to build lean muscle mass. But there are a lot of negative things that they do. What kind of problems are common? They don't build tendon tissue--the part of the body that attaches muscle to bone. And some research suggests it's actually weakened by steroids. Increasing the pull of a more powerful, larger muscle mass and not strengthening bone and tendon, can lead to tendon failure and or bone failure. Could steroids have contributed to McGwire's injuries? Tremendous physical stress is enough to cause the vast majority of those injuries, and it would be hard to say there was a causal relationship between the steroids and those injuries. But I don't think the steroids would have helped him or most other people. Really? Wouldn't an increase in muscle help someone recover? An isolated muscle injury might be the only one that a steroid could even potentially help heal. Steroids help incorporate amino acids into protein and build more strength in muscle groups. The problem is that most of these injuries are not isolated injuries--they're problems with the muscle and the tendon. Do you ever prescribe steroids to help people recover from injuries? No, I think the potential for harm is dramatically greater than any potential for gain. What are the problems of using steroids, especially for an extended period? An increased risk of various cancers--liver, testicular, prostate, brain--and heart disease. Anabolic steroids lead to a rise in LDL, or bad cholesterol, and decreases in your HDL, or good cholesterol, and it's dramatic. Then there are psychiatric issues--anger and aggression. But athletes don't seem to care very much about the harm. What's the motivation? There are clearly gains. Steroids really increase muscle strength and mass. The thing that bothers me about someone like McGwire is the trickle-down effect. He's been very successful and accomplished amazing physical feats. We can talk about the negatives as long as we want, but if you talk about a young 15- or 16-year-old baseball player who thinks he'll die if he doesn't achieve some spectacular sports success, then they may reach for steroids to be like Mark McGwire. I don't think he needed steroids to achieve what he did because of his incredible talent and passion for his sport. It may have hurt, and I'm not sure it helped him.